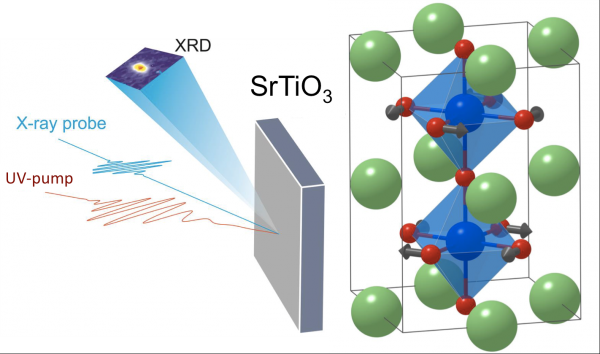 MARVEL researchers were part of a group that used ultrafast X-ray diffraction to show how photodoping triggers a purely structural phase transition in a perovskite. The research was published in Physical Review Letters. Researchers at institutions including the Paul Scherrer Institute and the University of Bern have used a combination of experiment and theory to show that photoexcitation—optical excitation of the electronic system—with laser pulses can drive a purely structural phase transition in a perovskite. Understanding how and how fast we can drive atoms to create structural phase transitions is interesting because it directly relates to many processes in nature and is necessary knowledge for potential applications such as in data storage. While studies have looked at electronically driven phase transitions, less is known about purely structural phase transitions, which are governed solely by interactions within the system of phonons, the vibrations that rattle the atomic lattice and spread heat through a material. The researchers used ultrafast X-ray diffraction to detect the change in the material's state. In this experiment, researchers used femto second laser pulses to excite the material inducing a rapid shift in the material’s state. The scientists observed an instant motion of the atoms approaching the other phase by using ultrafast X-ray diffraction at the FEMTO slicing source of the Swiss Light Source at the Paul Scherrer institute. While they expected the change in state to be on a timescale driven by the rate of heat transfer from the electronic to the lattice system, the lattice—and therefore the atoms—responded faster than they expected. There are many such phase transition in these kinds of materials and so the question now is, is this generally applicable or is it just in this case? The other big question is if it can be turned into a technological application or is it just nice science? Surprised by what they saw, the experimentalists turned to a group of theorists including Professor Ulrich Aschauer at the University of Bern for help. These colleagues used calculations based on density functional theory (DFT) as well as an analytical model to both support the observed timescale theoretically and to ultimately show that the rapid transition can be explained by the creation of holes during photodoping rather than just heating up the lattice. The theory helped the researchers to understand why the atomic position instantly starts to change after the excitation and predicts which of the not directly experimentally observable lattice vibrations are altered by the excitation. The group benefited from access to the ultra-short x-ray pulses at PSI to test excited structures that are otherwise not accessible—this allowed them to test the basic theories of their understanding about the material. Largely improved opportunities have just become available at PSI with SwissFEL, one of the few places in the world that offers intense femtosecond x-ray pulses. The researchers plan additional experiments to continue investigating the science between these shifts in state. Time-resolved x-ray diffraction experiments were performed on the X05LA beamline at the Swiss Light Source (SLS), Paul Scherrer Institut, Villigen, Switzerland. Static x-ray characterization of the sample was performed at the X04SA beamline (SLS). The research leading to these results has received funding from the Swiss National Science Foundation and its National Centers of Competence in Research, NCCR MUST, and NCCR MARVEL as well as other sources. The paper, Ultrafast Relaxation Dynamics of the Antiferrodistortive Phase in Ca Doped SrTiO3, can be found here.